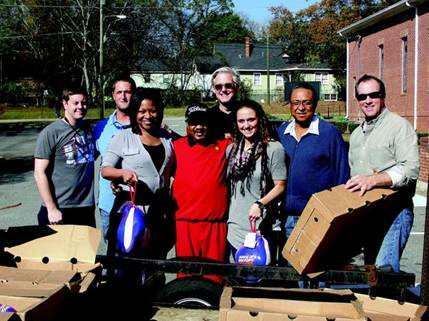 Our Milledgeville Turkey Giveaway was a Great Success! Local families in need of Thanksgiving turkey were provided with a free holiday bird at Flagg Chapel Baptist Church last week thanks to the annual donation by Campus Crest Communities Inc. 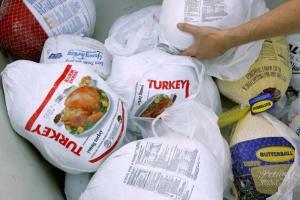 This year, Campus Crest donated a total of 675 turkeys. The company’s first Gobbler Giveaway event of the year took place Friday, Nov. 16 at Kingdom Fellowship Christian Center located in Charlotte, N.C.
“We’re lucky to be involved with great people like [Pastor Reid],” said Ted Rollins, Campus Crest co-founder and CEO. Campus Crest Communities Inc., a leading developer, builder, owner and manager of high-quality, resident life focused student housing, including locally The Grove Apartments, recruited F ortegra Financial Corporation, Onyx Pharmaceuticals Inc. and Brandywine Realty Trust to participate in its eighth annual Gobbler Giveaway event. Together, the companies partnered with 13 different charities and faith-based organizations to provide more than 1,900 turkeys to families in need this holiday season. 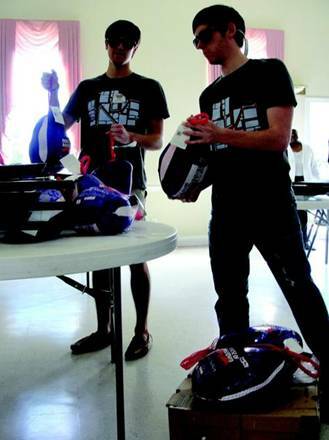 The annual event began shortly after Campus Crest’s inception in 2004 and is an integral part of the company’s broad corporate social responsibility program, according to an event press release. Over the past seven years, Campus Crest has steadily ramped up its efforts to grow the initiative, resulting in the donation of approximately 4,000 turkeys to residents in communities where the company owns and operates student housing properties. This is the first year Campus Crest has enlisted the help of other businesses to grow the initiative and replicate the event in their respective communities.